Saalt Cup vs Diva Cup: Which One is Best for You? Home » Menstrual Cup Comparison » Saalt Cup vs Diva Cup: Which One is Best for You? It’s a battle of the old vs the new. The Diva Cup is the most popular menstrual cup in the world and has been around for years. 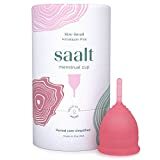 The Saalt Cup is a very recent newcomer to the scene, but it’s quickly becoming quite a popular menstrual cup. Both the Saalt Cup (USA) and the Diva Cup (Canada) are made in North America from medical grade silicone. They are both top-quality period cups that have some great reviews and ratings over on Amazon. In terms of sizing and design, the Diva Cup and Saalt Menstrual Cup are very similar to each other. Keep on reading for the specific details about that. In reality, you couldn’t go wrong with either one of these cups. But, because the Saalt Cup offers a 2-cycle money-back guarantee, we’ll give them the slight edge. We LOVE companies that let you try out their cup, and if doesn’t work for you, you can get your money back. The Saalt Cup is a newcomer to the menstrual cup world, but it looks like it’s here to stay. It’s a top-quality period cup that’s made from medical grade silicone in the USA. It has some excellent initial reviews over on Amazon and most people that try it really seem to like it. It’s a little bit softer than the Diva Cup and many people mention liking this in their review. The company wants to give people around the world an option for feminine hygiene products, because too many go without. They have partnered with a few organization to offer assistance towards this goal. In terms of the cup itself, it’s pretty standard is size and design. They offer a small (hasn’t given birth vaginally) and large (has given birth vaginally). The dimensions are very similar to the Diva Cup. Keep on reading for the full details, including specific dimensions. If there’s one menstrual cup brand you’ve heard of, it’s probably the Diva Cup! That’s because it’s the most popular period cup in the world, and it’s the one you can most often find on store shelves. The Diva Cup is made in Canada from top-quality, medical grade silicone according to strict manufacturing standards. It’s so good that many people start with the Diva Cup, and end up sticking with if for the rest of their lives. If you take a look over on Amazon, you’ll see that there are thousands of 4-5 star reviews of this product. Most of the negative reviews are about menstrual cups in general, and not specifically about the Diva Cup. This makes sense because the Diva Cup is often the first cup that beginners start with. In terms of sizing and design, the Diva Cup is the one to which all others are compared. There is a small (hasn’t given birth vaginally, under 30) and large (has given birth vaginally, over 30) version. If there is going to be only one menstrual cup on the shelves at your local shop, it’ll probably be the Diva Cup! It’s the most popular menstrual cup in the world and it’s widely available. As you can see from the above comparison chart, the Saalt Cup and the Diva Cup are nearly identical in terms of size. The major difference is the small version—the Diva Cup has a capacity of 30 ml, while the Saalt Cup holds 25 ml. This doesn’t matter too much for someone with a light-average flow. If you have a heavy period, then neither of these cups should be your first choice—consider a high-capacity menstrual cup instead. Otherwise, all 4 cups (small + large of each one) are 70 mm in length. The diameters are nearly identical. If you take a look at pictures of both these cups, you can see that they’re very close to each other in terms of design. The only real differences are the stem, and the firmness of the cup. Overall, the Saalt Cup is softer than the Diva Cup, particularly with the stem. Although they’re both the same length, you may find that you don’t have to trim the Saalt Stem like you would with a Diva Cup. Even though it may be sticking out a little bit, most people found it so soft that they weren’t really bothered with this. In terms of stiffness, the Saalt Cup is slightly softer. Soft menstrual cups often feel more comfortable inside you, and won’t cause cramps for some people like the firmer cups will. However, they are often a bit more difficult to insert because they don’t just pop open easily. That’s why we often recommend an average-firm cup for beginners. In reality, the choice is yours, and although the Saalt Cup is slightly softer than the Diva Cup, the difference is not that big. What about the Saalt Menstrual Cup vs. the very popular, new menstrual cup, the Lena Cup? Check out: Saalt Cup vs. Lena Cup. Both are excellent menstrual cups and you couldn’t really go wrong with either of them! They’re both made in North America from medical grade silicone and have plenty of satisfied customers over on Amazon. The slight difference between these cups it in the firmness. The Diva Cup is considered to have an average firmness, while the Saalt Cup is slightly softer. With this in mind, you may want to stick with the Diva Cup is you’re a beginner, because it’ll be a little bit easier to insert. If you’re a more advanced period cup user who wants a softer cup, then the Saalt Cup might be your #1 pick. However, in reality, the difference is not big and even beginners should be able to insert the Saalt Cup easily, and most people find the Diva Cup comfortable. One thing to take note of is that the Saalt Cup has a money-back guarantee. You can try it for 2 cycles, and if you’re not happy with it, you can get a refund. The Diva Cup does not have this, although they do have excellent customer service and will help you out. It’s for this reason that the slight edge in our Saalt Cup vs Diva Cup show-down goes to the Saalt Cup. What do you think about the Diva Cup vs the Saalt Cup? Which one is the winner? Leave a comment below and let us know your thoughts. And be sure to share this article on Twitter, Pinterest, or Facebook. « Intimina Lily Cup One for Teens: Is it Right for You?